Manufacturers estimate that 50% of their products will be smart and connected by 2020. Are you one of them? Follow our webinar and hear Emmanuel Bricard, CIO of e.l.m. leblanc (Bosch Group) share his success story on connected boilers and Markus Meukel, VP IoT at McKinsey&Company highlight the key IoT trends in the manufacturing sector. The discussion will be introduced and moderated by Werner Reuss, Head of Industrial IoT at Orange Business Services. - How connected products can power new business models and increase revenue? - What are the challenges in launching an industrial IoT project? - How to move from monitoring products to implementing predictive Maintenance models? - What are the best practices in IIoT transformations? With the digital revolution came the multiplication of technologies. - I have multiple suppliers per region and/or per service. How can I manage them efficiently? – How to manage my local internet service providers for my SD WAN deployment? - Do I really have full visibility and control over my suppliers? - Shall I completely or partially outsource my IT Service Management operations? whilst embracing downsizing and cost savings ? efficient way with our Multisourcing Service Integration MSI). Orange and Cisco can ensure your SD-WAN solution will be secure, agile, flexible and operationaly efficient on a global scale, while remaining cost effective by leveraging your existing infrastructure. One of the key concerns of GDPR is how organisations should implement the Right to be Forgotten. Not just because of the impact on resource, but because the majority of organisations don’t have a complete view of their data. In order to be forgotten you need to be found. Our panel of experts will discuss how to understand your data landscape so you know the size of your data problem. In a short space of time we can demonstrate what you should proactively do about your unstructured data; should a breach occur. Mobile devices are now considered to be one of the weakest links in the IT infrastructure of most enterprises. While the cost of a mobile breach is similar to that of a desktop or laptop breach, an astounding number of enterprises are still lacking next generation protection, leaving themselves at high risk of attack. Orange Cyber Defense has teamed with Check Point to lay down the hard facts surrounding the mobile threat landscape based on insight from current research and a deep understanding of the global market. The webinar will deliver practical advice surrounding common myths and offer a simple methodology approach which can be applied across the business. •Why 100% of enterprises are at risk of attack. •What next generation mobile cyber attacks look like. •Vital steps enterprises should take to protect themselves. Before the end of this year, local banks need to perform SWIFT’s Self-Assessment with 16 mandatory and 11 optional security controls. This will need to be repeated annually. Failure to comply will result in reporting to the financial regulator in your country. As your trusted SWIFT VPN Alliance Silver or Gold supplier, and as a global Cybersecurity specialist that is now also listed in SWIFT’s directory of Cybersecurity Service Providers, we know what this is all about. We can help you with this assessment, or with other important cybersecurity aspects that are not yet included in the assessment (e.g. Incident response, 24X7 CyberSOC, Threat Intelligence, …). Join us for this webinar to see how Orange can support you with SWIFT's Self Assessment. As a trusted SWIFT VPN Alliance Silver or Gold supplier, and as a global Cybersecurity specialist that is now also listed in SWIFT’s directory of Cybersecurity Service Providers, we know what this is all about. We can help you with this assessment, or with other important cybersecurity aspects that are not yet included in the assessment (e.g. Incident response, 24X7 CyberSOC, Threat Intelligence, …). As a trusted SWIFT VPN Alliance Silver or Gold supplier and as a global Cybersecurity specialist that is now also listed in SWIFT’s directory of Cybersecurity Service Providers, we know what this is all about. We can help you with this assessment, or with other important cybersecurity aspects that are not yet included in the assessment (e.g. Incident response, 24X7 CyberSOC, Threat Intelligence, …). Join us on this webinar to see how Orange can help you with your SWIFT Self Assessment. The adoption of cloud architecture is a process that requires a huge amount of effort to maximize benefits and minimize risk. To ensure the smooth transition of every function, application, and piece of data, it is essential to have a strong migration plan in place. When planning a cloud migration, Enterprises need to consider how much effort is actually required, they need foresight to ensure continuity of IT services to the business, and knowledge of what changes in the application architecture are necessary. Our speaker Mikhail Gloukhovtsev is a Senior Cloud Solutions Architect at Orange Business Services, an expert in IT infrastructure solutions, and one of the first 100 EMC certified ITaaS Cloud Experts worldwide. • Sourcing the right cloud model – Software as a Service (SaaS), Platform as a Service (PaaS) or Infrastructure as a Service. • Delivery options – private, public or hybrid – for each application workload. • Defining the methodology for application and data migrations. By creating a cloud migration plan, enterprises can de-risk cloud migration programs and accelerate their digital transformation program to ensure they remain relevant to customers’ changing needs and expectations. - Visibility of WiFi channel utilization and location, enabling you to switch frequencies to ensure high levels of performance and see which “passers by” do not connect – which is particularly useful in the retail and hospitality sectors. Orange Business Services, one of four global providers of Cisco Meraki, will share it’s tips on how three customers in the manufacturing, retail and electronics sectors, have been able to get the most out of the solution. The largest Distributed Denial of Service (DDoS) attack doubled in size over the last year. They’re now bigger, more complex, and require more expertise and tools to defend against than in the past. What action do you need to make it harder for an attacker to render your network unresponsive? • Ways of minimizing the risk that IoT platforms will be used in attacks against the Internet’s central infrastructure, such as Domain Name Servers (DNS), and your business. 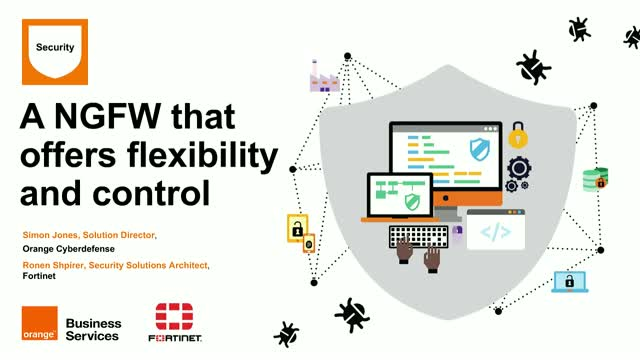 This session will help you create better end-to-end infrastructure resiliency and incident handling processes. Are cybercriminals using the dark web to buy and sell your customer and employee data, intellectual property and malware? Highly specialist expertise, big data tools and Artificial Intelligence are essential to detect and mitigate the threats to your enterprise. Mainstream search engines are unable to penetrate and index these hidden parts of the Internet. Access to sites is often restricted to cybercriminals who are recommended by a current member. Meanwhile, the cost of cybercrime is forecast to hit $6 trillion annually by 2021 according to Cybersecurity Ventures. It’s an issue that can’t be ignored. From inspiration to transformation. Together. Orange Business Services is a global network operator, IT systems integrator, managed security services provider and consultant. We have deep expertise in cloud, mobile, social, IoT (Internet of Things), big data and cybersecurity in a diverse range of industry verticals. Our focus is on “humanizing technology” – helping enterprises create better digital experiences for employees and customers to drive business growth.